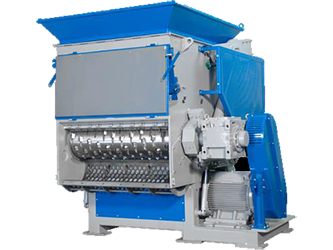 The G shredders are single shaft shredders with a powerful two speed swing ram design eliminating the risk of blocking and wearing out of internal guide rails. The machine is very versatile and can be used for shredding of all kinds of input materials and is well suited for different industries. The 457 mm diameter rotors ranging form 850 to 2000 mm width are driven by one or two oversized gearboxes. The hydraulic power pack is well integrated into the machine housing to save space and protect it from damage but still easy to access or remove for maintenance. The standard E rotor features the proven Virtus Equipment knife and knife holder design, as well as outboard bearings and a hydraulically operated screen cradle. The machines can be tailored to various applications with cooling or hard facing and other wear options. The G shredders have been designed for a wide array of applications and industries like in house and general recycling, electronic waste and post-consumer waste handling. Input materials can be all kinds, like lumps, pipes, woven bags; electronic waste like cables and ICBs, paper, wood and other organic materials. Depending on input material and the following process the shredded material as defined by the used screen size can be directly used or go into the next step of size reduction for example in a H granulator. The R series shredders benefit from sturdy ram construction incorporating heavy-duty guide bearings and universal couplings for reliable operation.